Monday nights in Gamble Auditorium begin loudly. Crowds of students — who wouldn’t have otherwise connected from 7 to 10 p.m. — pour in and assume their seats in waves of bustling conversation. It’s fun to look around the sea of friends, classmates, those you casually say “hi” to and those you’ve never met, all in a space of self-reflection and discovery of shared interests. 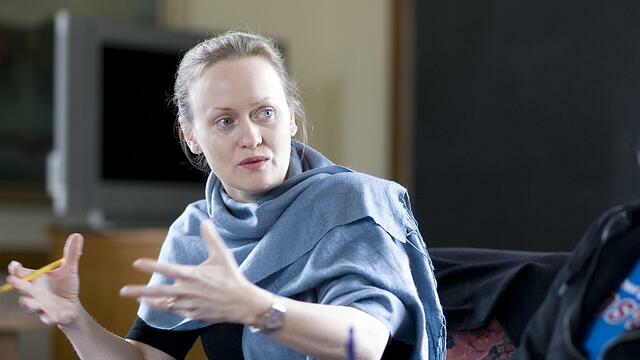 In College 211’s biggest class yet, 289 student eyes shift to Eleanor Townsley, professor of sociology and director of Nexus: Curriculum to Career, who is fabulously vested in her classic silky blue shawl. Townsley always begins the evening with a syllabus of activity goals. College 211 is a time for synthesis, thoughtful reflection and curriculum-to-career goal expansion. 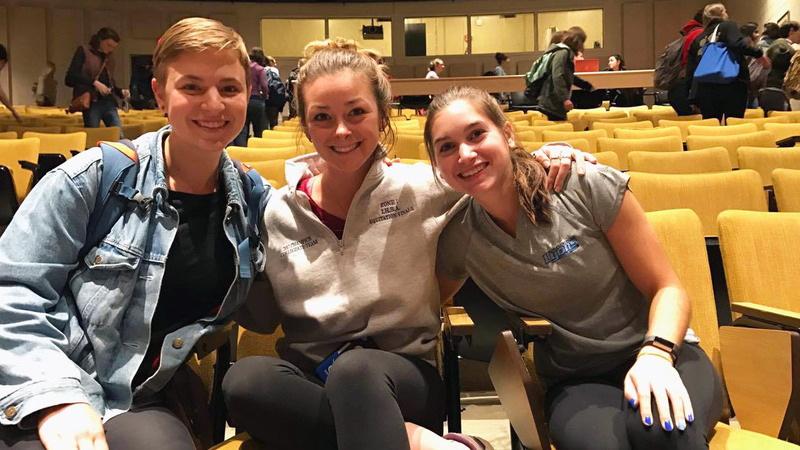 By making fresh connections, students learn how to tell an informed story of who they are, paving the way for the rest of their lives. The class culminates with the entirely student-driven Learning from Application (LEAP) Symposium, where panels of students showcase their summer work. College 211 draws quite the crowd. Class #1: Know your audience. To kick off the series, we break into several random pairs to practice marketing our summer experiences toward different audiences — a best friend, a job recruiter, the company’s CEO. The mixing and mingling feels like a speed-dating scenario of internship exchanges! As Townsley dramatically hits the stopwatch, we quickly learn to include the most impactful points, tailored for the audience, when describing our adventures. Class #2: Find your people. This year’s LEAP Symposium is comprised of 68 four-student panels, all of which aspire to reflect similarities and intersections among students’ summer work. We form panels in this session through networking and connecting with MoHos — skills I’ll be exercising next year as an alumna. In a swarm of students walking around the giant auditorium, we ask one another about our summers. I eventually find my people: journalists who participated in urban, small town, regional and niche publications. In each other, we find a well-balanced venn diagram of shared and different experiences. 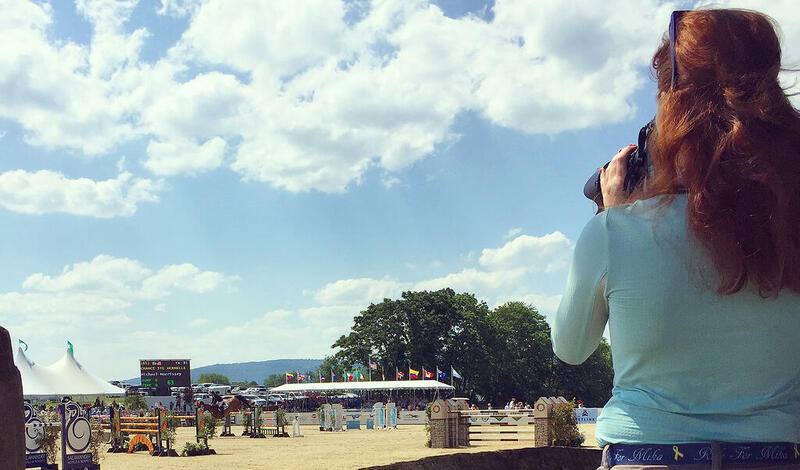 Maddy Skrak ’18 scopes the scene at the 2017 Upperville Colt & Horse Show. Sometimes I feel as though I’m the only one who has had a particular experience. But finding my panel refreshes how much I have in common with my peers, even if they didn’t work at a niche horse magazine in rural Virginia, like I did! My favorite class of the series focuses on what makes a good presentation. In Townsley’s (smile-inducing) Australian accent, she gives an impromptu Public Speaking 101. It includes a crash course on breathing, rooting our feet and shaking the shakes out — all to enforce confident and effective presentations and help us connect with an audience. Each panel then discusses finding a faculty moderator for its presentation and collaborates to write a group abstract summary for their theme. In working with my team I learned two things: that writing an abstract is much harder than it seems, even for a small group. And that I fully believe each of my new friends is capable of writing for The New York Times! This week, nerves and a collective realization that “LEAP is this week!” hits the crowd gathered in Gamble’s mustard-colored seats. Townsley opens up with a few last-minute tips and gives a Stacy London – style “what not to wear” talk. Next, pairs of panels take turns reviewing each other’s presentations to share constructive advice. It took me a dress rehearsal to realize that my presentation was double the time allowed, so I knew exactly what I had to practice. In our final class, Townsley introduces a panel of eight faculty and staff with impressive resumes — each taking minutes to recite. The panelists answer questions about making good first impressions and preparing for interviews, and also share nuggets of wisdom from personal triumphs and tribulations. Anecdote by anecdote, of winding and unexpected paths to their current positions, this power group of panelists relieves some pressure resting on student shoulders. Everyone in the audience seems to collectively exhale some of their worries. 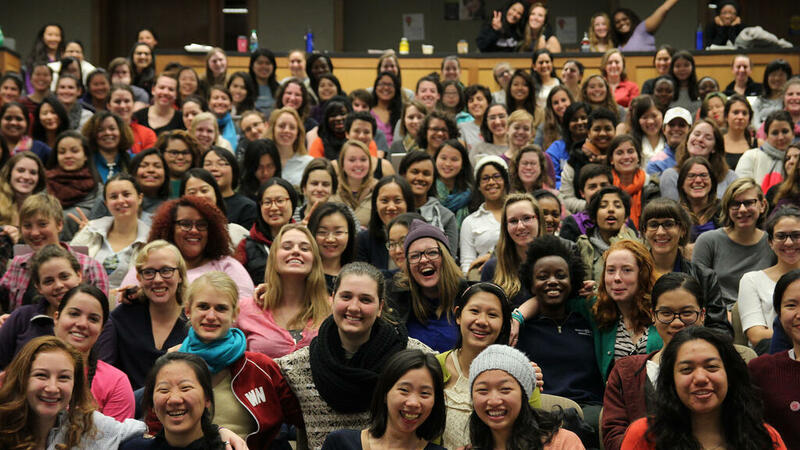 After our final assignment, to reach out to a Mount Holyoke graduate via the Alumnae Directory, College 211 is a wrap! Now, whatever will I do Monday nights? Sometimes it’s easy to forget just how impactful, enlightening and maturing a three-month adventure can be. After interning at the Chronicle of the Horse magazine, the busyness of returning to school quickly recaptured my focus. 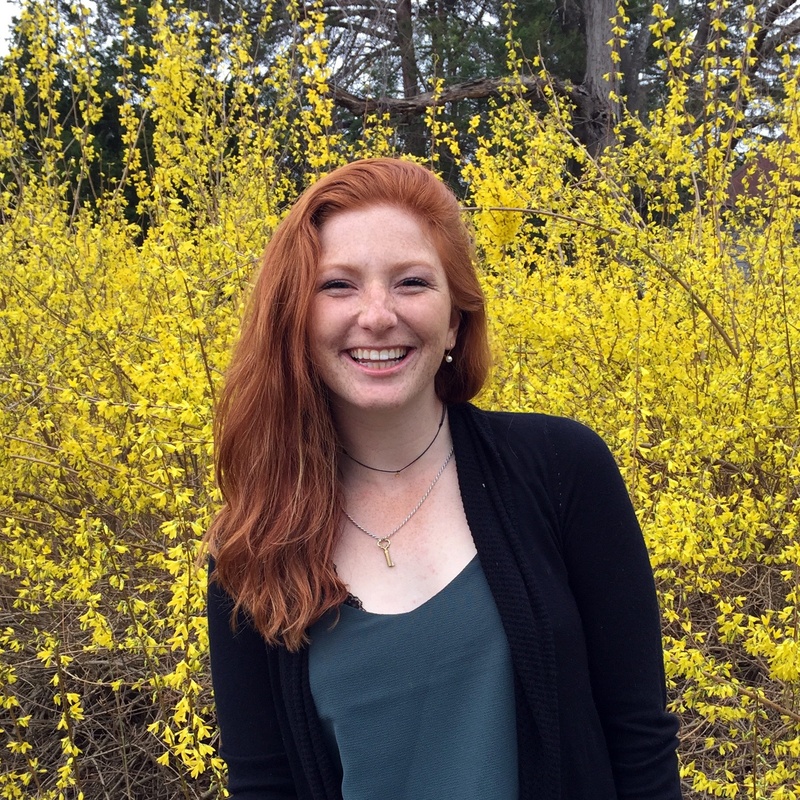 Having College 211 in my schedule provided a time that I wouldn’t have otherwise devoted for career preparation and inner dialogue — and for actively unpacking and revisiting my experience. Doing so with others puts it all into an important perspective, by making our learning seem more real through combining diverse views across similar career fields. 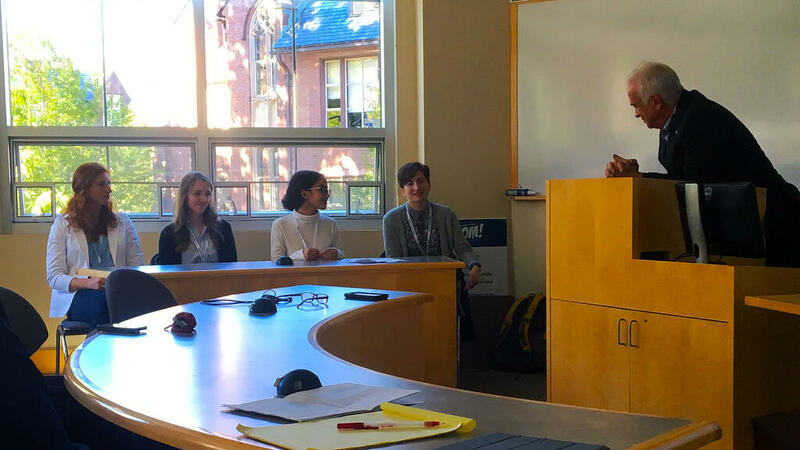 Shown, from left: senior LEAP panelists Maddy Skrak, Eileen O’Grady, Sana Hasan and Rebecca Mullen with moderator Todd Brewster. Processing my magazine internship with other journalists opened a door to further explore complexities within the industry. Although I had individually recognized that working as a journalist today involves several demands that weren’t expected in the past, as a group we were able to put a label on this phenomenon, calling it the “six-in-one journalist” effect. As life goes by, experiences distance themselves in your rearview mirror. By taking College 211, I drive forward with my summer internship — and the insights, skills and life lessons it brought — right beside me. My career goals stay firmly in focus and out of my blind spot. All of which is well worth some late Monday nights!